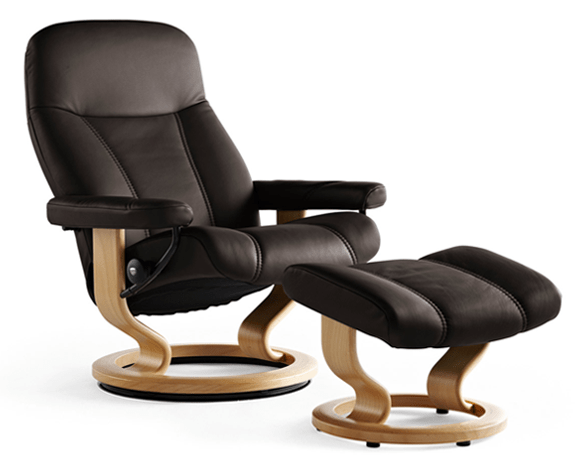 Enjoy traditional design and simple lines with the Stressless Consul (M) recliner. The high back and supportive headrest offer support for your entire back and neck. Relax in comfort knowing your body is supported with patented ergonomic technology. The Glide system effortlessly adjusts to your body’s position and movement for personalized comfort and support. 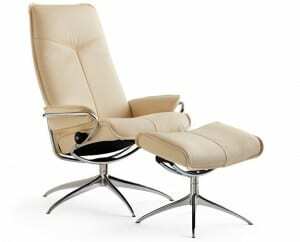 Lean back and allow your body to sink into its plush, foam cushioning. Classic wood accents and a 360 swivel look elegant while allowing you to adjust your view with ease. The cushioned ottoman supports your feet and legs after a long day for full-body comfort from head to toe. The Consul (M) is well suited for individuals of average body size and stature. The internal Glide technology senses your body’s movement and adjusts support where you need it most. Luxurious padding, elegant wood, and fine lines offer incomparable beauty and comfort. A durable 360 swivel allows you to change your positioning in the room. Made with high-quality materials and rich Scandinavian design, the Consul (M) is an easy choice for long-term luxurious comfort. The Consul (M) offers the perfect combination of striking good looks and functionality. Smooth leather and classy wood accents dress up this traditional chair to look great with any home décor. 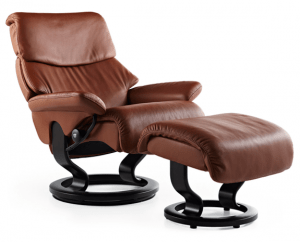 Guard your health and protect your back and neck by choosing Ekornes Stressless furniture. We ship to any address in all 50 United States. Ask for details regarding shipments to Canada. For quality assurance, all Consul (M) shipments must be insured for accident, loss, or damage. Once your shipment leaves our facility, a tracking number is provided via email. Unless otherwise stated, delivery means “to your door”. Shipments must be signed for by someone over 18 years of age.